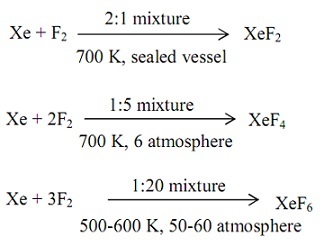 Xenon difluoride, XeF2 can now be made up via a simple reaction of xenon and fluorine gases in a Pyrex bulb in the sunlight. However, still the compounds of the noble gases were unknown until the year 1962. Is it not amazing that a compound that can be prepared so simply eluded the world of science for so long? One reason for this is that most of the reactions were taken out on argon, that was the most readily available, and the outcomes of experiments on argon, wire thought to apply to all the noble gases. Moissan, in the year 1986, found that argon wouldn't react by fluorine under any circumstances. Secondly, attempts at reacting xenon by fluorine by employing electric discharge methods didn't meet up with success, however Pauling had predicted that a few noble gas fluorides must be stable Chemists were discouraged by such failures and as well by the preconceived notion that the noble gases should be inert due to their stable configuration. The first get through in the noble gas compounds was achieved in the year l960 via an English chemist Neil Banlett. He was trying to form the newly discovered compound PtF6; rather he gets a deep red compound having oxygen. The X-ray diffraction picture of the red solid showed it to be the first identified salt of dioxygennyl cation, that is, |O2|+|PtF6|-. This illustrated that PtF6 oxidizes the oxygen molecule. Hurtled realized that xenon must form an analogous compound due to the ionization energy of xenon, 1170 kJ mol-1, is slightly lower than that of the oxygen molecule, 1180 K.J mol-1. Whenever he brought xenon and PtF6 altogether, he get an orange yellow solid, xenon hexafluoroplatinate, [Xe]+[PtF6]-. This opened the field for the study of chemistry of the noble gases. True chemical bonding in the noble gases looks to be restricted to krypton, xenon and radon with fluorine or oxygen as ligands. None, though, joins with oxygen directly. The oxides are made up from the fluorides whenever they react by water. Krypton chemistry is restricted to the difluoride, KrF2, which is stable only below 353 K, and one or two complexes by fluorine bridges between the krypton and the other element. Radon is acknowledged to form at least one Chloride; however its formula has not yet been established due to the vigorous disintegration of the nucleus. Therefore, the noble gas chemistry is efficiently limited to the compounds of xenon. The compounds XeF2, XeF4 and XeF6 are white solids that can be sublimed at room temperature. The lower fluorides react by fluorine on heating under pressure making higher fluorides. The fluorides are very strong oxidising and fluorinating agents. They react quantitatively by hydrogen. The fluorides vary in their reactivity with water. XeF2 dissolves unchanged in water or acidic solutions, however on standing, decomposition takes place slowly. Decomposition is more fast through alkali. By small quantities of water, partial hydrolysis takes place giving a colourless liquid xenon oxofluoride, XeOF4. The similar product is made whenever XeF6 reacts by silica or glass. Due to the stepwise reaction that finally generates the dangerous XeO3, XeF6 can't be handled in the glass or quartz apparatus. XeF2 acts as a fluoride donor and reacts by pentafluorides like, PF5, AsF5, SbF5, TaF5, RuF5, RhF5, IrF5 and PtF5 to form salts of the kinds [XeF]+|MF6]-, [XeF]+ [M2F11]- and [Xe2F3 [MF6]-. XeF4 is much less reactive in this respect and reacts merely by the strongest F- acceptors like SbF5 and BiF5. However XeF6 joins by pentafluorides to yield 1:1 complexes like, [XeF5]+[AsF6]-and [XeF5]+ [PtF6]-. The crystalline clathrates or inclusion complexes of noble gases have long been recognized. In such complexes the noble gas atoms are trapped in cavities in the crystal lattice of some other compounds like quinol or water. The formation of clathrates seems to based on relative molecular dimensions instead of on any particular chemical affinity. The atoms or molecules of any substance, which are of an appropriate size to fit in the cavities in the host lattice, can make clathrates. Therefore, O2, SO2, H2S and MeOH are the illustrations of other substances that form clathrates with quinol. Whenever quinol is crystallized from its aqueous solution in the presence of heavier noble gases such as Ar, Kr or Xe under a pressure of around 10 to 40 atmosphere, crystals of clathrates of the composition G.3Quinol are obtained. The crystals are fairly stable and can persist for some years. Though, whenever heated or dissolved in water, the gas escaped leaving behind quinol. Likewise, whenever water is allowed to freeze in the presence of Ar, Kr or Xe under pressure, atoms of noble gas get trapped in the crystal lattice of ice providing clathrates corresponding to the composition, 8G.46H2O. These clathrates are as well termed as the noble gas hydrates. We can observe the hydrates might not be stoichiometric as the degree to which the cavities are filled based on the partial pressure of the guest material. The hydrates increases in thermal stability down the group as the noble gases become more polarizable. By xenon, at a partial pressure of one atmosphere, the hydrate is stable up to 275 K. Due to their very low Polarisability, small size and low boiling points, no hydrates of helium and neon have been made. Clathrates give a means of storing noble gases and of handling the different radioactive isotopes of Kr and Xe that are produced in the nuclear reactors. We would remember that prior to year 1962; it was broadly assumed that the noble gases are chemically inert due to the stability of their electronic configurations. Though, the discovery that their compounds could be prepared made it essential that some explanation be given of the nature of bonding in the compounds they form. The nature of bonds and the orbitals employed for bonding in the compounds of noble gases is of great concern. It has been the subject of considerable controversy as will be obvious from the discussion of bonding in a few individual xenon compounds. This is a linear molecule. Bonding in XeF2 might be illustrated by the help of Valence Bond Theory. The electron from the 5p level of Xe is promoted to the 5d level, followed via sp3d hybridization. The two unpaired electrons in the axial orbitals form bonds having two fluorine atoms and three lone pairs occupy the equatorial positions of the trigonal bipyramid giving mount to a linear molecule as illustrated in the figure below. The objection to this model is that the 5d orbital of Xe seems to be too large and too high in energy to contribute in hybridization. Though, it has been recommended that the highly electronegative atoms such as fluorine cause a big contraction in the size of the d-orbitals enabling them to participate in the bonding. It is supposed that the 5pz orbital of xenon and the 2pz orbital of the two fluorine atoms are involved in bonding. 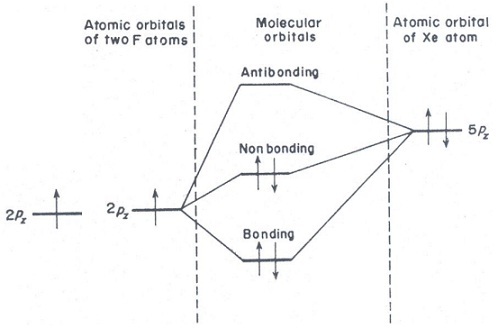 Such three atomic orbitals join to give three molecular orbitals, one bonding, one non-bonding and one anti-bonding that can be represented as shown in the figure below. The linear arrangement of atoms gives the best overlap of orbitals, in accordance by the observed structure. The condition is identical to that in the boron hydrides where there are three-centre B-H-B bonds. The structure of XeF4 is square planar (figure shown below). The Valence Bond Theory describes this by promoting two electrons resultant in sp3d2 hybridization. Two of the positions on the octahedron are occupied via two lone pairs. This gives rise to the square planar structure. The alternative description is that in XeF4, the Xe atom binds to four F atoms by employing two of its p-orbitals to form two three-centre molecular orbitals at right angle to one other, therefore giving a square planar shape. According to the M.O. theory, the structure of XeF6 can be described by considering three three-centre molecular orbitals mutually at right angles and providing a regular octahedral shape. Therefore, M.O. theory fails here to forecast the correct structure. Therefore, we have noticed above that neither the Valence Bond approach nor the Molecular Orbital theory is capable to describe the bonding in all the noble gas compounds. The approach which has given the most rational explanation regarding the stereochemistry of noble gas compounds and provided the most readily visualized explanation of their shapes is the Valence Shell Electron Pair Repulsion Theory (VSEPR) of Gillispie and Nyholm. To recollect, this theory supposes that the stereochemistry is found out by the repulsions between valence shell electron pairs, both bonding and non-bonding, and that the latter apply the stronger effect. 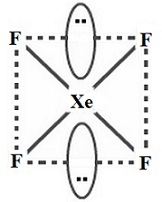 Therefore in XeF2, the valence shell of Xe atom consists of ten electrons, eight from the Xe atom and one each from the two F atoms. These are distributed in five pairs, two bonding and three non-bonding, which are directed to the corners of the trigonal bipyramid. Due to their greater mutual repulsion, the three non-bonding pairs are positioned in the equatorial plane at 120° to one other, leaving the two bonding pairs perpendicular to the plane and therefore producing a linear F-Xe-F molecule. 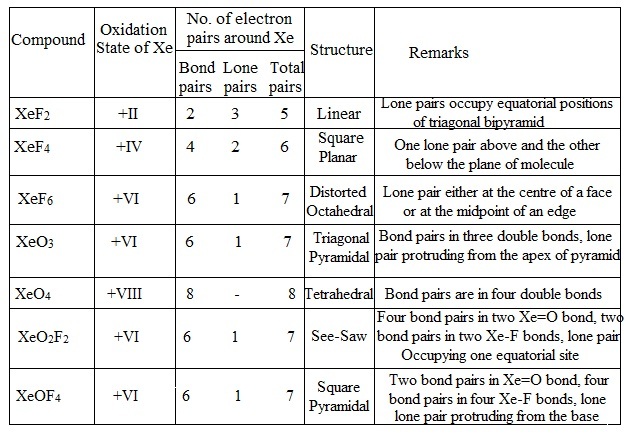 In the similar manner, XeF4 by six electron pairs is considered as pseudo-octahedral by its two non-bonding pairs opposite to pone other leaving the four F bonds in the plane around Xe. 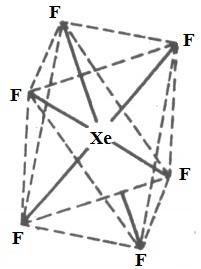 More particularly, the seven electron pairs around Xe in XeF6 propose the possibility of a non-regular octahedral geometry and imply a distorted structure based on either mono-capped octahedral or a pentagonal pyramidal arrangement of the electron pairs, having Xe-F bonds bending away from the protruding non-bonding pair. This will be interesting to devise identical rationalizations for the xenon oxides. 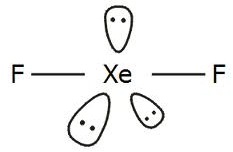 Three electron pairs of the Xe atom can be employed to complete the octet of three oxygen atoms, leaving on lone pair on xenon. This provides a trigonal pyramidal shape to XeO3 molecule (figure shown below). 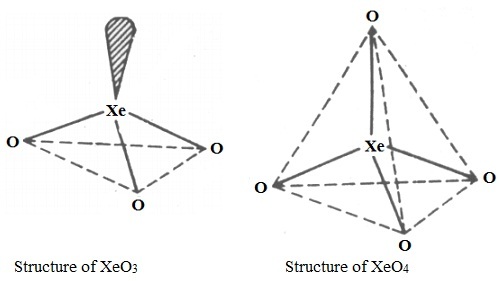 Likewise in the xenon tetroxide, four electron pairs from xenon can coordinate by each of the four oxygen making a tetrahedral molecule (figure below). Such coordination, though, leaves a rather high positive charge on the central atom. The tetrahedral silicate, phosphate and sulphate ions that are isoelectronic by XeO4, are stabilized by pπ-dπ back bonding in which the lone-pair electrons on oxygen spend some time in d-orbitals on the central atom. This assists us to even out the charge distribution. But 5d-orbitals of xenon are ill-matched by 2p-orbitals of oxygen, therefore weak Xe-O bond is consistent by instead little pπ-dπ bonding and considerable polar character. The structural details of some xenon compounds based on VSEPR theory are illustrated in the table described above. However, chemists were taken by surprise by the noble gas compounds however as you can see, these were soon found to be readily accommodated via current bonding theories.